For the 4th consecutive month Minnesota recorded warmer than normal temperatures. Observers reported mean monthly temperatures for December that were from 8 to 12 degrees F above normal, marking the warmest December in history on a statewide basis, surpassing the previous record from December 1939. Extremes for the month ranged from 53F at Marshall on the 9th to -11F at Thief River Falls on the 28th. On a statewide basis December of 2015 was the 2nd wettest in history, with an average value of nearly 1.90 inches. Some observers reported their wettest December in history, including: 4.09" at Two Harbors; 4.90" at Caledonia; 5.38" at La Crescent; 4.28" at Preston; and 4.00 inches at Spring Grove. Snowfall amounts for the month ranged from 3 to 10 inches, with many northern locations receiving over a foot. 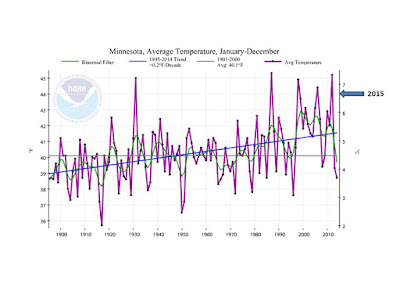 For the Twin Cities specifically, December of 2015 was the 2nd warmest in history, surpassed only by 1877. Only two days brought colder than normal temperatures. It was the 9th wettest in history with 2.31 inches at MSP Airport. Snowfall total was 9.4 inches. Only one day was sunny, and two days were partly cloudy. Mean annual temperatures from around that state for 2015 ranged from 1.5 to 2.5F above average, marking the 6th warmest year in history back to 1895 (statewide annual mean temperature was 44.0°F). The warmest temperature reading was 99F at Madison (Lac Qui Parle County) on June 10th, the coldest reading was -43F at Cotton (St Louis County) on February 20th. On a statewide basis, 2015 was wetter than normal, ranking 21st wettest since 1895. Many climate stations reported over 40 inches of precipitation for the year. Both Austin and Waseca had exceptionally wet years with approximately 45 inches of precipitation. Most snow fell at Isabella with 96.5 inches. The largest single day rainfall was 6.54 inches at Afton on July 6th. The Minnesota DNR-State Climatology Office posted the top 5 weather Events of 2015 on their web site this week. The warmest autumn statewide was rated the top event. Thanks to a wetter than normal month of December, combined with persistent heavy rains last week, NOAA hydrologists and meteorologists were issuing flood forecasts for many rivers throughout the USA, and especially the Mississippi River. Flood crests were expected on 400 rivers, with perhaps an all-time record flood crest on the Mississippi River near St Louis. The United Kingdom Met Office reported that Storm Frank brought 70-80 mph wind gusts and rainfall of 2-3 inches to many parts of Ireland, Scotland and northern England on Tuesday and Wednesday this week. In addition the UK Met Office reported that this "December was the Warmest in History", averaging 4.1C above normal across the country. It was also the wettest December in history for Scotland and Wales, averaging well over 6 inches of precipitation. The Oklahoma State Climatology Office reported this week that one of their Cooperative Observers located at Daisy (Atoka County) has reported a new statewide record annual precipitation of 89.69 inches, a phenomenal amount for that region of the country. Several other observers across Oklahoma and Texas report annual precipitation over 80 inches during 2015 as well. These numbers are equivalent to two years' worth of precipitation in most cases. Tropical Cyclone Ula was churning in the Souther Pacific Ocean, southeast of Pago Pago. It was expected to strengthen, producing winds up to 90 mph and sea waves of 25 to 30 feet. This storm will primarily remain out to sea and not affect any major islands in the area before dissipating early next week. You commented in Minnesota WeatherTalk about the extremely unusual temperatures on October 11th of this year at Browns Valley and Sabin with 96F and 97F respectively, well above the previous state record for that date. How many standard deviations are those values greater than the mean daily maximum temperature for that date? Statistically this is rare territory. The maximum temperature values at Browns Valley and Sabin on October 11th were about 3 to 3.5 times the standard deviation. That is roughly the equivalent of a maximum temperature reading of 69F or 70F on January 1st. Remarkable. The average MSP high temperature for this date is 24 degrees F (plus or minus 13 degrees F standard deviation), while the average low is 8 degrees F (plus or minus 14 degrees F standard deviation). MSP weather records for this date include: highest daily maximum temperature of 48 degrees F in 1897; lowest daily maximum temperature of -12 degrees F in 1974: lowest daily minimum temperature is -30 degrees F in 1974; highest daily minimum temperature of 42 F in 1897; record precipitation of 0.47 inches 1891; and record snowfall of 4.0 inches in 1914. Average dew point for January 1st is 8 degrees F, with a maximum of 36 degrees F in 1950 and a minimum of -38 degrees F in 1974. The state record high temperature for this date is 56 degrees F at Luverne (Rock County) in 1998. The state record low temperature for this date is -46 degrees F at St Vincent (Kittson County) in 1885. State record precipitation for this date is 1.75 inches at Elk River (Sherburne County) in 2007; and record snowfall is 18.0 inches at Ada (Norman County) in 1921. Frigid temperatures prevailed across the state on New Year's Day 1885, with -46F at St Vincent (Kittson County), -35F at Moorhead, and -19F at Duluth. Another frigid start to the New Year in 1899 with morning temperatures of -44F at Pokegama Dam and -40F at Detroit Lakes. The afternoon temperature rose no higher than -11F at Brainerd. 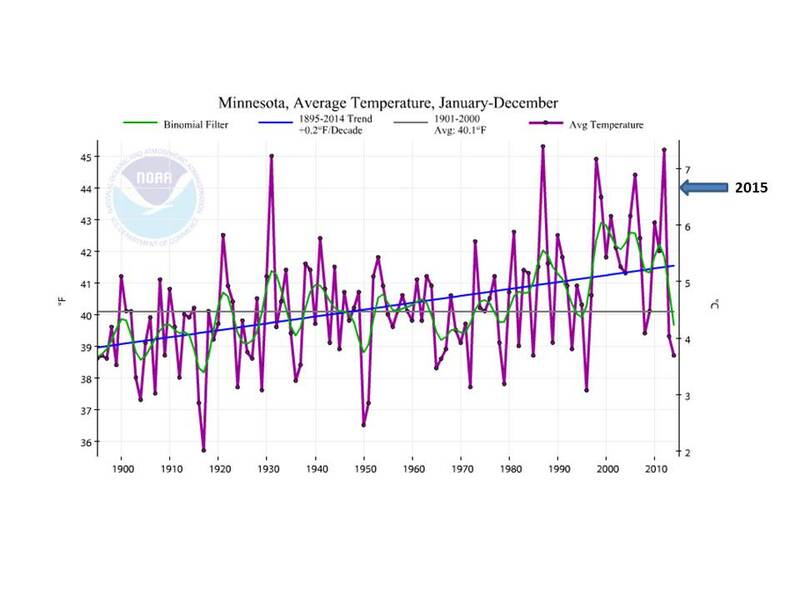 The most frigid start to the New Year in modern times was in 1974 when at least a dozen Minnesota communities started the year with a temperature of -40F or colder. It was -30F as far south as Zumbrota, and -35F at Pipestone. Temperatures remained below zero all day at most locations in the state. The New Year started unusually warm in 1897 with widespread afternoon temperatures in the 40s F. Many communities in southern Minnesota saw the thermometer climb into the 50s F, with an absence of snow cover. It was as warm as 52F as far north as Grand Marais. A major winter storm crossed the state over New Year's Day in 1911 bringing several inches of snowfall to central and southern portions of the state. Some observers in southern counties reported over a foot of new snow. A respite from winter occurred on New Year's Day in 1998 as many observers in central and southern Minnesota saw afternoon temperatures climb into the 40s and 50s F. It was 56F at Luverne, MN where some local residents enjoyed their lunch outside in the sunshine. Generally a sunny weekend coming up with temperatures near normal or slightly warmer than normal in most places. Continued much the same next week, and generally dry as well with an increasing chance of precipitation towards the end of next week. It seems I gave stopped receiving the weekly link to your blog. Have you changed this recently?